As we all know, making a New Year’s resolution is easy, but sticking to it isn’t. We know this because just over a week ago, you held a glass of wine up in the air to toast your commitment to a healthier lifestyle in 2018. Less than two weeks later, and what have you got to show for it? Well, if that box of jelly-filled, glazed donuts on your kitchen counter is any indication, we should think your resolution is doing quite poorly at the moment. You also resolved to make some wholesale changes to your home this year, starting with your seriously outdated kitchen. Fortunately for you, this resolution is all too easy to keep. 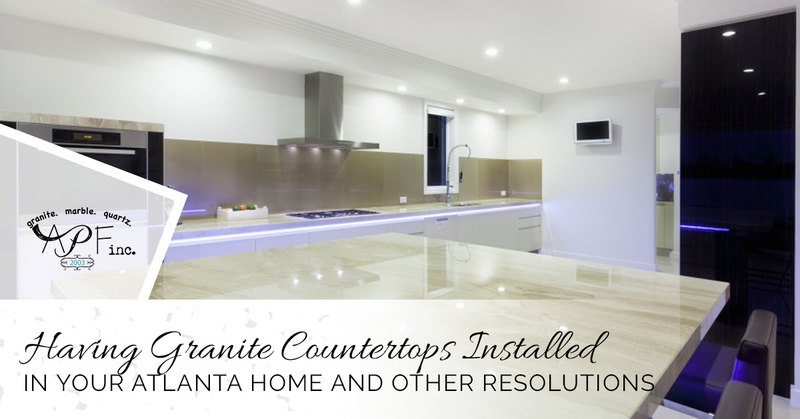 All you need to do is give A Polished Finish in Atlanta a call and in due time, you will enjoy a kitchen with beautiful granite countertops. But back to the other New Year’s resolutions you made, the ones you have failed at thus far. No need to feel bad or suffer guilt, you aren’t the only one to break resolutions. In fact, research tells us that more than half of people who vow resolutions will fail before the end of January. That’s the bad news concerning resolutions, but there is good news as well. The good news is that there are ways in which you can make it easier to keep your resolutions. Here are a few tips on getting your New Year’s resolutions to stick. If you have never run farther than a block or two chasing your children down after they escaped from your house, resolving to run a marathon by the end of the month is probably not a very good idea. While many will admire your moxie for such a brave commitment, they will no doubt be betting against you as the odds are in their favor that you would never even finish the race. If you wish to keep a resolution, think small. Perhaps you can start off by training for a marathon for six to eight months and see where that takes you. Start off by jogging around the block once or twice and then slowly expanding from that point on. Even though you might wish an entire overhaul of your lifestyle, stick to small changes you can actually make. It is admirable that you want to lose weight, gain muscle, stop drinking, stop smoking, become a vegetarian and run a marathon in 2018, but you are just setting yourself up for failure. The best approach is to narrow that down into smaller portions, something you can handle. For example, you can resolve to slowly eliminate meat from your diet or resolve to lose 25 pounds over a six-month period. You may resolve to lose 25 pounds or even more, that is just fine, just don’t resolve to do it in a month. If you really want to keep this resolution, you will have a better shot at it if you break it down. Resolve to lose three or four pounds a month until you reach your 25-pound goal. This way, instead of being disappointed if you lose 10 pounds in a month instead of 25, you will be thrilled when you lose five pounds the first month instead of three or four. Perfection is unattainable. Keep in mind that minor missteps are going to happen as you try to achieve your goals. Don’t ever completely give up on your goal to lose weight because you broke down and bought a box of jelly-filled, glazed donuts. Eat them up, feel a little shame and then move on. There is nothing wrong with accepting support from those who care about you. In fact, there is no shame in asking for support from those who care about you. If you are feeling a little overwhelmed and are in danger of buying another box of donuts, give someone a call and have them talk you down. If your family and friends aren’t enough to keep you on course, then find a professional who can help. There are professionals who are uniquely trained and can offer strategies on how to adjust your goals so they are attainable. Keeping your resolutions are important. So give A Polished Finish a call and get started on that new kitchen.